Nordic Honey partners with a select handful of small apiaries to offer high quality certified organic honey from Northern Europe. This means there are no noisy highways, dirty factories or chemically fertilized fields within three kilometers of our bee hives, allowing our nectar gatherers to live in peace and harmony with the world´s cleanest nature around them. Our gourmet honey is always non-GMO and free of antibiotics and pesticides. 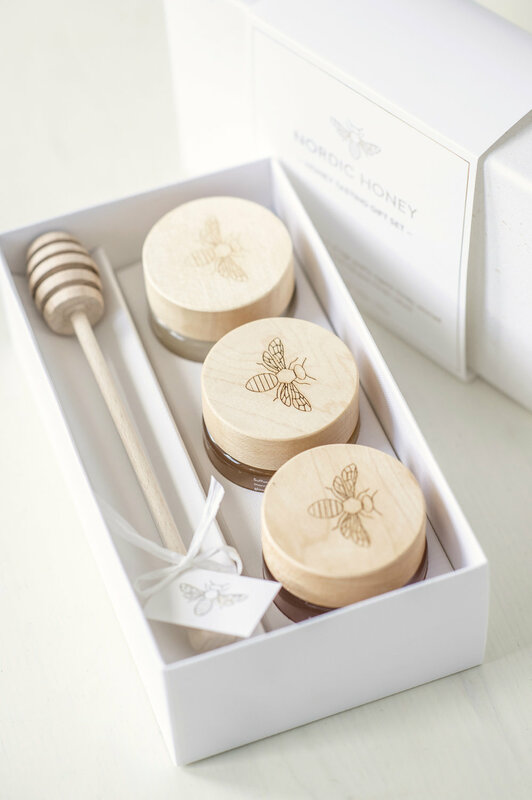 Our premium honey tasting gift sets include three jars of organic honey along with a beautiful wooden honey dipper. Presented just as beautifully as it tastes, this is a luxurious gourmet experience sure to satisfy any sweet tooth. A perfect gift set for a friend or a loved one. We are very excited to announce that since August our products are available at Amsterdam, Frankfurt and Munich airports. Please find us on the shelves of Fine Food stores. We are very excited to announce that our full honey collection is now available at Selfridges. Find us at the food halls of London, Birmingham and Manchester Trafford, and very soon online at www.selfridges.com. Autumn has definitely arrived and that means harvest time. Right now gardens and forests are full of fruits, berries and wild mushrooms that it is almost impossible to decide amongst so many fine and locally grown ingredients.